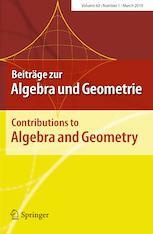 Beiträge zur Algebra und Geometrie / Contributions to Algebra and Geometry was founded in 1971 on the occasion of the 65th birthday of the mathematician Ott-Heinrich Keller, a longtime professor at Martin-Luther-University Halle-Wittenberg, and an important figure in the German Mathematical Society. In 1930, Keller posed a conjecture on cube-tiling which still stimulates researchers, and his subsequent work in algebraic geometry and topology endures today. In this tradition, the journal publishes high-impact research articles in the areas of algebra, geometry, algebraic geometry and related fields.